Located in downtown Concan just minutes from your river fun. This charming home has been newly renovated and is nestled on 1 full acre. There are oak trees with an enormous back yard for all of your enjoyment. BBQ, Horseshoes, or just relaxing in the South Texas breeze in the hammock. 1436 square feet, three bedrooms with an additional bunk room that is amazing!!! Just minutes from Fat Rob Tube Rental, Andy's, Neil's, House Pasture Bar and Grill, Joe Jimmys and all the excitement of Concan Texas!!!! We have enjoyed coming to the frio river for the past 25 years enjoying the relaxing atmosphere and river fun and have dreamed of owning a home here someday. Well that someday has come, and we hope you enjoy our home as much as we do. We purchased this property when it became available because it's the perfect place in Concan. 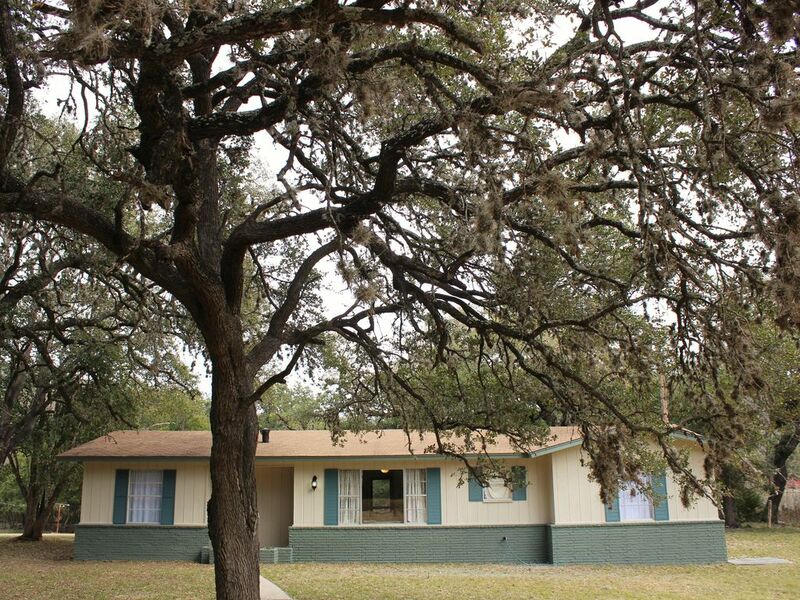 The property itself is beautiful with 100 year oaks spanning the front and back yards. We also liked the seclusion of the property. Most homes have neighbors within a few feet of them. Here, you have no neighbors to worry with and you feel much more comfortable. Close to everything!!!! The backyard is a gem. It is a place to sit by the fire and relax or play in the babbling brook that runs behind the property when the river is up. Guest must provide their own sheets, towels and linens. Our family really enjoyed this home. Room for 4 couples to each have their own space and the outdoor space was great! It was close to river, stores & restaurants. It is an older home and some things have been updated but not everything. The washer is still not working but we didn't need it for our stay. All in all a great place to stay and we would definitely stay here again! Was everything we expected and more! The house was perfect for our group of friends and only minutes away from a river drop off spot! It was fairly easy to find, was stocked with the kitchen essentials, and was even bigger than it appeared to look online. Ted and Lisa Mathis were also very thorough on what was needed to bring for the stay, which was extremely helpful. The house is very clean and decorated so cute! Sleeps 6adults and 4 children very comfortably! It is right off the main highway, close to the Garner State Park and even closer to Neals and shops! Has most of the essentials you need to cook and clean. 2 full baths are pretty clean. Washer and Dryer (washer wasn’t working but we survived without it) The owners were very accommodating! This is a very nice property. Very close to everything and the rooms are great. I think we spent more time playing volleyball at the house. River was a low but backyard made up for it. Pros: Good size, comfortably fit 4 adults and 6 kids. Good size kitchen with full size fridge. Close to Garner & Neal’s. Nice back patio & large yard. Cons: Gross showers-mildew & rusty, washing machine doesn’t work (according to notes left in the house by others who have stayed, has not worked for over a year, yet the listing doesn’t mention it doesn’t work), hammock has a huge hole in it and is not useable, TV in kids room was not hooked up properly (my husband spent over a. hour re-running the wires to get it to work), volleyball net is torn up and not useable, one of the bedroom closest has a terrible moldy/mildew smell coming from it, all comforters & pillows on the beds were disgusting-covered in dirt, stains, and smelled horrible. This was not a cheap place to stay and I was very frustrated by the features that attracted us to this particular house were not in good working order. Could be a really nice place to stay but needs some TLC & maintenance. We loved the bunk room and the back patio area! Super cute and slept all 10 adults comfortably. The mattresses were much more comfortable than most rentals! We'll be back!